Occasionally I foster a puppy, either for a rescue organization or a breeder friend of mine who does a lot of work with service and working dogs. As I've mentioned before, I really want to learn to sketch dogs--especially my own dogs--, but I still just can't pull it off. My pages are a mess (maybe I'll show one of those disasters here some day) and my dogs look more like creatures from the Black Lagoon than loving companions! Anyhow, for the last two weeks I fostered a delightful little female German Shepherd who has now gone off to her permanent home. I wanted to scribble a little something to remember her by and since I have a hang-up about dog drawing (which I know I have to work on...but I'm sharing the good, the bad, and the ugly here), well, I decided to draw her favorite toys. So, if you are one of those people who really wants to draw a special pet or a special person but you find yourself always disappointed with what you do, why not try drawing some of his or her favorite things? 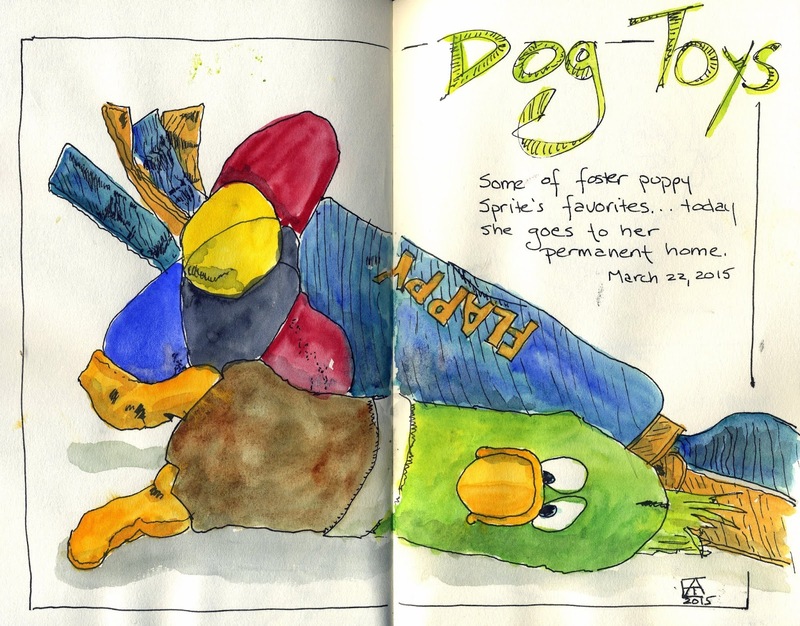 I thought a lot about the puppy's personality and the great time I had playing with her as I draw these toys--a lovely meditation that brought me great delight! And, of course, keep practicing drawing the people and the pets! We will get better at it if we keep practicing!